Ten years ago, the European Space Agency launched the Rosetta probe tasked to orbit a comet for the very first time and study it up close with unprecedented detail. Six billion miles later, the probe reached its target, the four-kilometer wide 67P comet, and has beamed back some of the most breathtaking images of a comet science has witnessed. The most recent shot released by ESA captures the comet so close that we can even see its intricate topography. 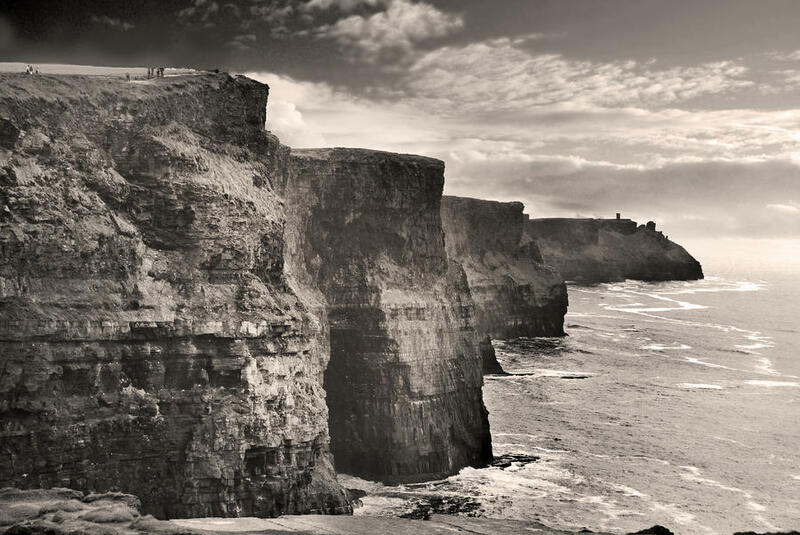 Captioned below, the photograph in question was captured while Rosetta was hovering only 65 miles (104 kilometers) away from the 2.5-mile-wide (four-kilometer) comet. We can clearly distinguish the three sections of the comet: the head (top view – filled with cliff-like structures), neck (narrow middle view – a smooth surface) and body (bottom view – riddled with peaks and valleys). Looks familiar? Sure it does. It’s a beautiful mountain (of ice) hurling away in space! How often do you get to see that? If this is a comet, where’s its tail? Ahh, the magic is about to happen soon enough when 67P’s orbit will enter an area where the sun’s radiation is greater, causing ice displacement and melting. 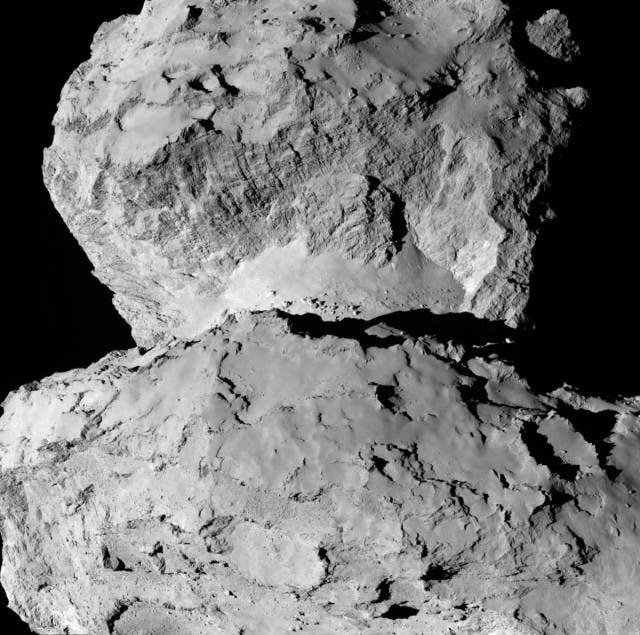 That’s when the comet’s corona and tail will form and Rosetta will be there to image the event in all its splendor. Before this happens, though, Rosetta is tasked with a mission of even greater importance. Some scientists believe comets play a crucial role in distributing compounds throughout the solar system that are quintessential to forming life. This November, the spacecraft will get close enough to the comet to release the Philae lander, a tiny probe that will drill through the comet’s insides and analyze its chemical makeup. BONUS! 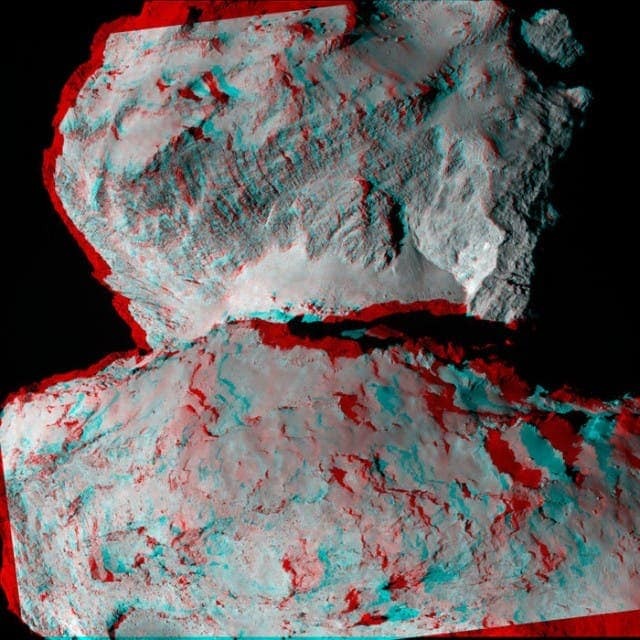 Below is the same image of 67P, only in 3D. You’ll need 3D glasses to view it, so dust off those old theater goggles from the attic.